The creation and travel of sound is the starting point for the mechanism of hearing. Sound travels to the ear and then to the brain stem and the cerebral cortex (in the brain) to interpret sound. Before we can hear anything, a sound must be generated. Whether the sound is someone’s voice, a siren, or thunderclap, vibrations are created. These vibrations can travel through air, metal, water, wood, etc. This concept functions the same way human vocal cords vibrate to create the sounds that we use to generate speech. The vibrations exist in a wave form that eventually makes it to our ears. The wave that is created is important to how we will perceive the sound. The external ear acts as a funnel for sounds. Sound travels inside the ear to the tympanic membrane (eardrum). The sound waves that come into contact with the tympanic membrane are converted into vibrations that are sensed by a group of tiny bones, known as the middle ear ossicles. They are comprised of the malleus (hammer), incus (anvil), and stapes (stirrup). 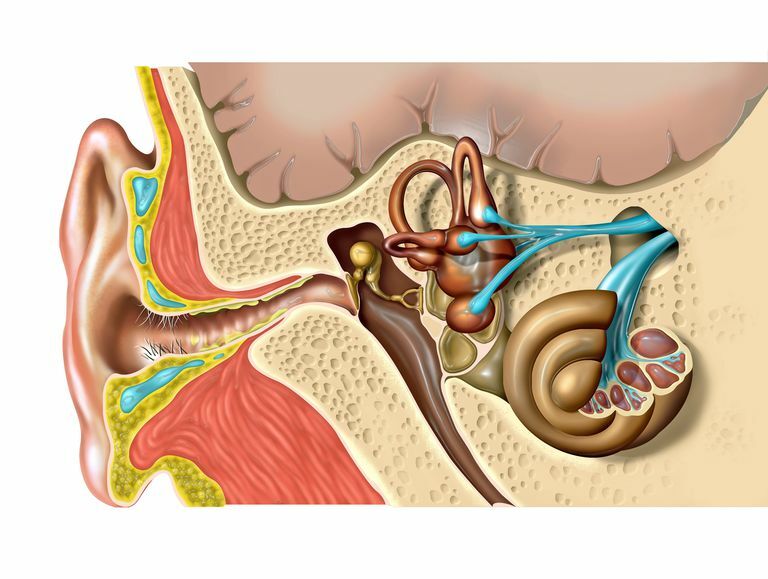 The malleus is the first to conduct the vibration, which then continues through the incus and ends at the stapes, which is in contact with the oval (vestibular) window, which separates the middle ear from the inner ear. The function of the inner ear starts when conduction of the sound wave reaches the oval window. The sound wave then travels through the cochlea, which looks like a snail’s shell. The cochlea is divided into three fluid-filled chambers. Different chambers are receptive to different frequencies. The signal then goes into the cochlear duct causing vibration of endolymph (a specialized fluid) where the signal is converted into an electrical impulse that is transferred to the cochlear and vestibular nerves. The cochlea ends at the round window, where the sound wave is finally dispersed as hydraulic pressure. The hearing mechanism actually consists of two functional units: the right ear and the left ear. The units are identical; however, they each have an important role in the determination of sound. The medulla oblongata (lower portion of the brainstem) receives signals from the vestibulocochlear nerve at different timing and strength intervals depending on where the sound is coming from, the way the head is turned, and the distance of the sound. The difference in timing and intensity is important in providing a 3-dimensional aspect to sound. The brainstem sends the signal to the midbrain and then subsequently to the auditory cortex of the temporal lobes of the brain where the electrical impulses are interpreted as the sounds that we experience. Jarvis, C. (2004). Ears. In Physical Examination & Health Assessment (341-370). St. Louis, Missouri: Saunders. National Institutes of Health. Information About Hearing, Communication, and Understanding. Could my hearing loss be otosclerosis?